Often people mistakenly think a daily practise involves lots of extra time or access to wide open spaces. But really, a daily practise is something that can be worked into your everyday routine if you are willing to bring your awareness into the present moment ~ and that doesn’t take more than a few seconds while you are in motion. When you are pretty far removed from nature in the city, it can feel like you are unable to connect with these forces when surrounded by concrete and steel in a small space. By placing your attention on the divine that permeates all around you, you can easily tap into the interconnectedness that pervades urban and rural unhindered by time or distance. When you realise that the expansive, loving feeling that nature effortlessly spurs within you doesn’t derive from your surroundings there are a number of ways to consciously tune in. As you make your morning beverage actively recognise the elements of air, fire, water and earth that play a role in what is in your cup – where is it made? How is it made? What does it consist of? What process does it go through to get to you? Pay attention to how the city sounds at different times of the day, on different days of the week and with the varying seasons. Can you feel the energy shift too? Let the above examples inspire you to let a simple daily practise, no matter how short, become a living breathing part of your day right now. Through Air you come to know your Thinking Self; thoughts, beliefs, emotion, your viewpoint and understanding of how the cosmos works. Since sound travels through air this element is also about listening and refining your skill to hear the utterances from the unified field. 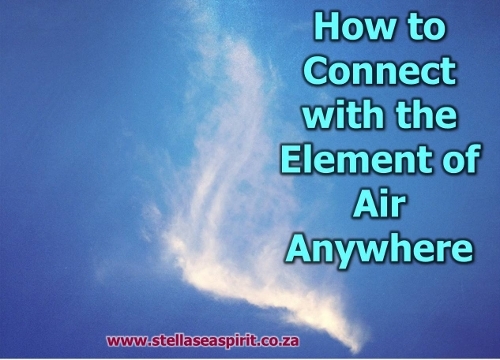 This post will show you how to connect with the element of Air no matter where you are within a few minutes, even with nosy neighbours or non-magical folk around. Air is the element of the mind and thought is the fastest way to bridge the gap between where you are now and where you want to be. Wherever you find yourself sitting or standing; take 3 slow, deep breaths, call to mind an image that evokes the element of Air for you such as windswept seeds, falling leaves, feathers or wisps of incense smoke. Focussing on this representation in your mind’s eye, sense the cosmic winds that flow around and through you, carrying answers, gratitude and requests to and from the ether. Bringing shifts in perspective, new thought patterns and clearing away the old. Ask for the element of air to guide you and to give you a message regarding your present circumstance. You may feel a sensation or hear an intuitive voice at once or it may find its way to you later. Become aware of your presence in your body, claiming all scattered aspects of yourself and drawing them into this moment. Release the image and go about your day. Through Fire you come to know your Radiant Self; stepping into your power, claiming your ability to flow with and mould Creative Essence purposefully into meaningful experience and just enjoying and demonstrating exuberance for life. 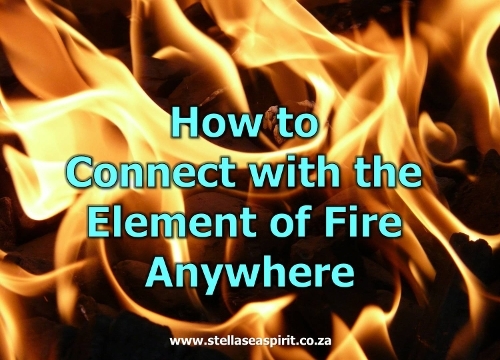 This post shows you how to connect with the element of Fire no matter where you are within a few minutes, even with nosy neighbours or non-magical folk around. Fire is the element of passion and inspiration. Will you dare to take match your actions with your highest wisdom? Wherever you find yourself sitting or standing; take 3 slow, deep breaths, in your mind’s eye become aware of the fire within you. See this flame at your core burning at a steady, poised rate. The energy it generates is enough to solder, temper, transmute or raze at a moment’s notice. Is it weak and sputtering or a raging inferno? Adjust the flame so that you are comfortable with its burn rate. You can always repeat the exercise and fine-tune as required later. Now with your attention on the flame, ask for the element of fire to guide you with a message regarding your present circumstance. You may feel a sensation or hear an intuitive voice at once or it may find its way to you later. Become aware of your presence in your body, resolving trust in your inner guidance and stepping forward in your expression of truth. Release the vision and go about your day. Through Water you come to know your Emotional Self; processing and dispersing both what serves and what doesn’t in a constant stream of possibilities, skilfully navigating the highs and lows so you are allowing and receiving in a constant state of flux. 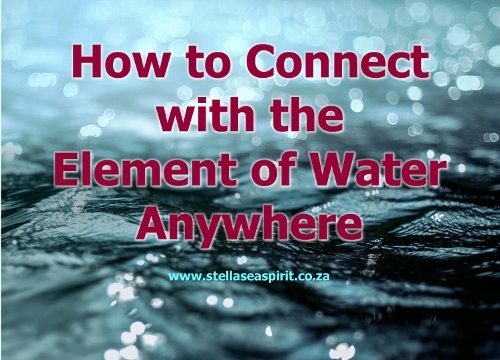 This post shows you how to connect with the element of water no matter where you are within a few minutes, even with nosy neighbours or non-magical folk around. Water is the element of emotion and intuition. The water in your body ebbs and flows responding to lunar energy, so you are more listless and creative when the moon waxes and noticeably more energetic and active when it wanes. Wherever you find yourself, sitting or standing; take 3 slow, deep breaths, call to mind something that evokes the element of water for you, this can be mist, seashells, a waterfall or the colour aquamarine. Concentrating on this link become aware of the blood coursing through your arteries and veins, sensing the fluid pulse in your energy centres, washing away past hurts, resolving imbalances and elucidating turmoil. Ask for the element of water to guide you as you ease into the flow of cosmic rhythm for the current to bring you what is in accordance with your highest most joyful path. You may feel a sensation, hear an intuitive voice or glimpse a dreamy vision. Bring your awareness back to your centre, release the moment and go about your day. Through Earth you come to know your Physical Self as an infinite being mastering your ability to fuse Spirit and matter in a human experience, navigating various cycles where you hold the space for what can be without attachment to the result. 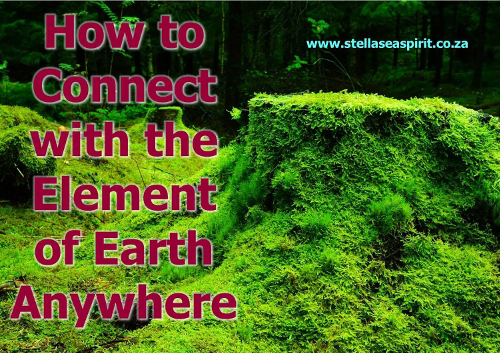 This post shows you how to connect with the element of Earth no matter where you are within a few minutes, even with nosy neighbours or non-magical folk around. Earth is the element of matter and grounds you so that you can conduct and receive energy signals better. Without grounding your intentions on the material plane they will remain castles in the air. Wherever you find yourself sitting or standing; take 3 slow, deep breaths, call to mind an image that evokes the element of Earth, such as the texture of wood, a crystal, basket of fruit or lush green foliage. Contemplating this image let your core connect with the Earth’s core sensing the energy stream of all relations who have walked before you on this planebeneath the soles of your feet, while the light of your starry lineage enters your crown chakra from above. Inhale and let the energies of earth and sky meet and swirl in your heart centre. Exhaling let this unified energy surge out from your heart into the vast fertile, abundant matrix within which all creative potential exists. Ask for the element of Earth to guide you and to give you a message regarding your present circumstance. You may feel a sensation or hear an intuitive voice at once or it may find its way to you later. Feel your cells respond as you open mind and heart to fresh possibilities and blessings, carrying it forward with you as you emerge from this moment, releaseand go about your day. Your energy is required by the dreams you are creating as well as daily chores and commitments you already have on your plate. How do you keep your energy from becoming dispersed, your focus from becoming scattered and your own needs met? 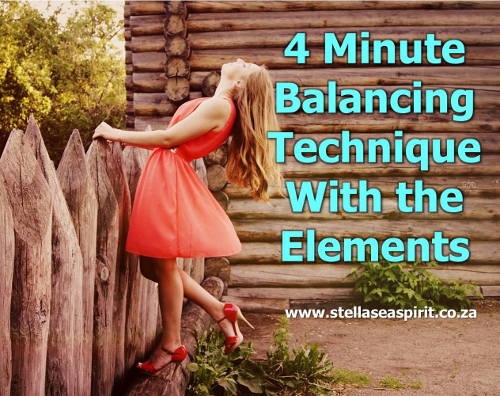 The four elements surround you, readily available for you to harness their gifts at any time. Grounding is the process where you consciously reinforce your connection with the life force energy that constantly courses through you and root it firmly into the Earth. You are a conduit and your body is a vessel, in this way you conduct a greater volume and higher frequency of energy with more ease, ensure a consistent replenishment of life force and exude a more powerful, focussed charge. Imagine a sparkling beam of light entering your crown chakra, coursing down your body to exit from the soles of your feet. Become aware of the fresh scent of something you love about the Earth for example, pine needles, freshly baked bread or percolating coffee. Feel your feet firmly planted on the ground or your back fully supported by your chair. Inhale deeply from your belly or the base of your spine and place your attention on your thoughts. You could see them as wispy clouds floating about within your energy field. Notice the varying textures, colours and intensity with which some flow. Simply observe them in your mind’s eye and net the ones that feel good, separating them from the ones that feel less than and just plain yuck! What story are you scripting for yourself? Are you telling your tale forward from this moment through who you are now or are you telling your story from the past? Listen to the whirl of words in your mind space – are they carrying your seeds of intention to fertile lands? Net the good feeling thoughts, for example, “my daughter and her baby have a healthy, happy birth”, “my novel is complete” and “I pass my certification with flying colours.” Pop them into your heart-space like cotton candy melting in your mouth. Let the less-than thoughts and icky ones like, “I can’t do this”, “I will never finish this chapter” and “what if …” get whooshed away by a strong gust of intellectual wind. Retrieve all your scattered energy, predominantly emotions and scenarios which you leant a lot of emotional weight to. Such as an argument with your spouse, irritations in the post office queue, replaying of how you could have said or done something differently during a heated exchange etcetera. Know that you can honour the feelings of others without needing to fix them. Know that you can be completely present and listen to another without taking on their baggage for them. Know that it is alright to feel whatever emotions surface and that you will emerge from them as soon as you have discharged their vibration. For example, become aware of how you are feeling at various times in your day and choose to spiral up if you aren’t content with your emotional state. This may mean doing something else briefly that stirs your well of creativity and nurtures your soul just enough to allow you to return with a renewed perspective of the undercurrent of the issue at hand. Visualise all your energy retracting from these scenes like streams of water returning to you, their ocean. Let it wash through your cells, cleansing them of all that no longer serves you and draining into the earth’s core for transmutation. Envision yourself as you would like to move through your next step. Own that sense of achieving what it is you set out to do, claim the sensation of receiving the answer, clarity, solution or opportunity you seek. Become you in that space now already before it is. True power is fuelled from within. If you find yourself complacent in a holding pattern that you are too fearful to emerge from, one that you maintain with thoughts of someday and procrastination, remember that the first step needs to come from you, even if your only action is to ask what your next step is. Where have you been complacent? What within you keeps things the way they have been? How can you forge anew inside of this present moment? Take inspired action, for example, if you feel called to drive across town for an organic green smoothie, you may meet synchronicity there! Affirm that you are ready and open to receive what you are asking for. Then allow it to enter your space by letting go of this exercise and going about your day as usual, trusting that what you need in alignment with your highest good will be delivered to you in a perfect way which you will notice with ease. For people of different belief systems, angels can become somewhat of a common ground. Through sharing experiences, books and simply adding them to décor or even cuisine, a diverse gathering can all relate in some way. An angelic being is a spiritual essence most widely associated as a messenger between realms. They have been described in all major religions but are now increasingly popular beyond formal religion by those seeking to connect with more of their own spiritual nature. Some people may feel uncomfortable calling on angels by their traditional religion-oriented names, so instead of specifically naming an angel you can refer to them by their expertise such as, “the angel of communication” or “angel of protection”. 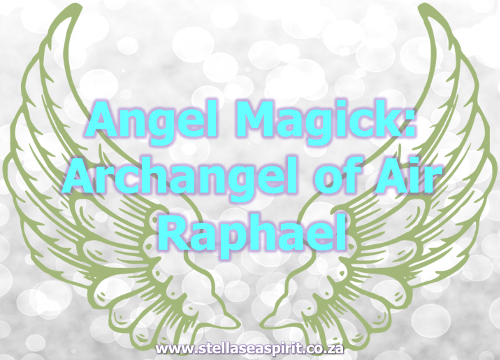 Angelics are indeed magical beings and they adore ritual, whether you are actively inviting them or just asking them to lend their light to your working they are eager to contribute energy and carry your intentions to the higher planes. I’m also not advocating giving your power away and relying on the angels to tend to your every need as if as though you are helpless or incapable of creating your own outcomes – it’s just useful to have a little help from your magical friends who can see further and move swifter. The Hebrew word rapha means “doctor” or “healer”. Raphael assists with all forms of healing; the Earth and all creatures upon her including humankind. Healing is not restricted to the physical body but encompasses mind, emotion and spirit as well as space clearing and auric cleansing. Call upon Raphael for safe travel, passage, aiding in smooth accommodation, customs and luggage arrangements. Travel also includes spiritual journeys like astral travel, shamanic vison quests and so on. Raphael is the angel who gifted Solomon with the pentagram, a gold ring engraved with it to “subdue all demons”. (I’m inclined to interpret “demons” as lower astral entities). He is also the patron saint of the blind and helps develop your inner vision. Did you know that the word “angel” stems from the Greek version of the Hebrewmal’akh which means “shadow side of deity”? It seems kind of counterintuitive since one always associates angels with dazzling light. So what then is meant by this? Well it just means that the work of angels takes place in a way that is unseenhence in the shadows beyond ordinary sight where you cannot see the various changes taking place. Just like a Witch’s Book of Shadows is all about working with forces and realms that are unseen. Because of their higher energy angels help us draw more harmony, love, compassion and peace into our lives when you remember to call upon them and specifically ask them to assist you in your daily life they can do so in many ways. Michael’s name means “he who is like God”. 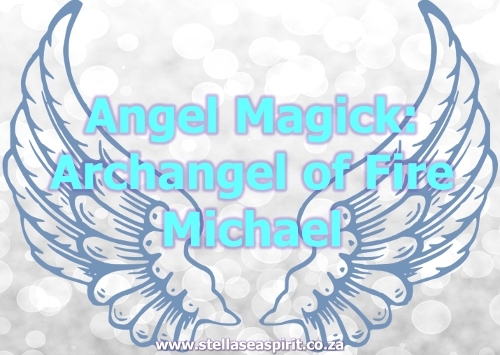 Archangel Michael assists with protection, faith, personal strength and power. His main objective is to eliminate fear from our realm. Call upon him to cleanse people and places of negativity. What many don’t know is that he watches over sacred healing waters (wells, streams, fountains) and guards shrines created in honour of the Goddess/divine feminine. Angels don’t necessarily appear as shining winged beings, they could take on human form or even a part human and animal form like the original cherubs who had four faces; human, eagle, ox and lion. Somehow cherubs were reduced to chubby baby-like beings… I presume for the same purpose that the Fae were diminished. Angels may appear as flaming pillars of light or shapes of opalescent air. Sometimes they materialise as humans that exude a comforting, loving or protective presence. I consider wings a symbol of the higher frequency and ability to move between dimensions. Feathers are often associated with angels, but have you stopped to think why? I can’t help but notice when I pick up a feather whatever colour, shape or size that it resembles a vortex in some way; a conduit from the spiritual to the physical. You have wings too! See images of wings embedded in the human body here. Gabriel’s name is Sumerian in origin and means “governor of light” or “strength of God”. Archangel Gabriel is also known as Abruel, Jibril, Jiburili, Serafili. 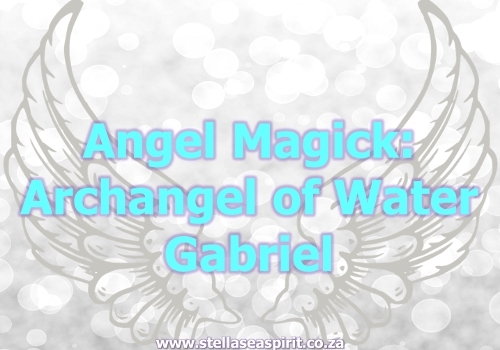 Archangel Gabriel is known as the messenger angel and assists with raising your vibration/consciousness and getting clear on the next best step for you. Call upon her (him to some) to assist with matters regarding children and spreading higher messages through any form of art or communication media. What many don’t know about her is that she is the guardian of Goddess/divine feminine energy on Earth, safeguards those who serve this energy and also oversees transformation, death and revelation of mystery. According to Hebrew legend, whilst in the womb we retain all memory of other incarnations until Archangel Gabriel arrives just before we are born, pressing a finger to our lips and uttering “Shh.” This is when we take on the veil of forgetting who we are and where we originate from as we enter this plane. The “proof” of this myth is in the cleft of our upper lip ~ the fingerprint of Gabriel. The higher your vibration is the easier it is to connect with and receive messages from angelics. When you are consumed with heavy emotions or negativity it’s like you are tuned into two different channels. Relaxation, meditation, music and candlelight help facilitate an optimal frame of mind. You may notice their presence through appealing to whichever your natural strongest sense is. You may see them, hear them, smell a fragrance they manifest with or feel them. Calling on the angels for assistance and actively asking them for intervention does not mean you are worshipping them; rather they act as a bridge between realms. Give your wishes to the angels, they’ll take them higher! You hear another voice speak as if there is someone else in the room (this is not the same as mental illness, in the sense that the voice never tells you to harm yourself or others). Ask angelics to help you communicate the highest truth and compassion through all you say and do, ask them to guide your actions and facilitate the highest outcomes for all involved. Ask angelics to support your goals for the day whether it be finding a new job, protecting your family or happening upon the perfect gift for someone. They are multidimensional and non-physical so they don’t get tired and have the ability to be in a myriad of places all at once. So when you ask for assistance you are not taking them away from their duties or impairing their abilities to help others. Uriel’s name means “God’s light” or “fire of God”. He assists those who offer ministration to others e.g. social workers, lawyers, teachers and journalists. Uriel is the guardian of writers and psychics who aim to serve the greater good through their work. 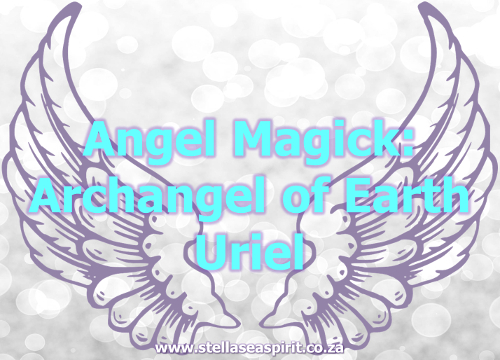 Archangel Uriel is associated with thunder and lightning and assists in averting or healing and recovering from natural disasters and Earth changes. Uriel is regarded as the angel who brought knowledge and practise of alchemy and the Kabbalah to humankind. Releasing toxic situations and emotions like regret, sorrow, pain, guilt, shame or blame. Bringing personal and spiritual expansion (beware because with expansion comes cleansing/removal of what no longer matches who you are and/or more of what you are placing your attention on)!